Another camp summer is history. We praise the Lord for the team, the program, the campers, the families and most of all the eternal results of Ci 3.0. Energy Theater - Campers acted out energy transformations and transfers as a unit of energy. Solar Oven - Campers designed and created an object that would use the energy from the sun to cook s’mores. Food Energy - Campers measured and computed the amount of calories a piece of food would provide for our bodies. Robotics - Campers designed and programmed their own EV3 Lego Robot. Rube Goldberg Machines - Campers built their own Rube Goldberg machine that would use energy or momentum transfers to ring a bell. Data Analysis - After watching Felix Baumgartner's historic jump, we graphed his descent as well as discussed how to interpret a graph and predict using a graph. Drone Racing - Campers learned the technology behind drones and were taught how to safely control a drone in flight. The obstacle course consisted of flying a drone through a series of rings. Kids Camp -- This camp was a huge hit for campers grades 3-6 and will result in future campers for our teen overnight camps. Family Camp -- The parents LOVED experiencing robotics and STEM along with their children. None of them had ever built a robot with their kids!! AiG Volunteer Program -- We were able to donate 150 man hours of labor to Answers in Genesis during one of our Teen Day camps as the number of campers was lower than expected. This was a special blessing for me as it allowed us to express our appreciation to AiG for the many ways they support Ci in the mission God has called us to!! Intern -- Our first time for one of our counselors to do an internship at AiG!! One of our girls, a physics major, who first attended our Ci 2.0 College Apologetics Camp, is doing an internship under Dr. Danny Faulkner!!! We are excited to see how this works out in the hopes of doing more of these in the future. One of our challenges as we attract talented counselors is that we can't offer them an entire summer of work yet. An internship is very attractive to some. Largest Week of Camp!! -- 46 at our 7-day! We maxed out the resources of Potter's Ranch, so we now know our enrollment limits for this property. First time to have overnight campers who were day campers at Ci 2.0!!! This model seems to work well. 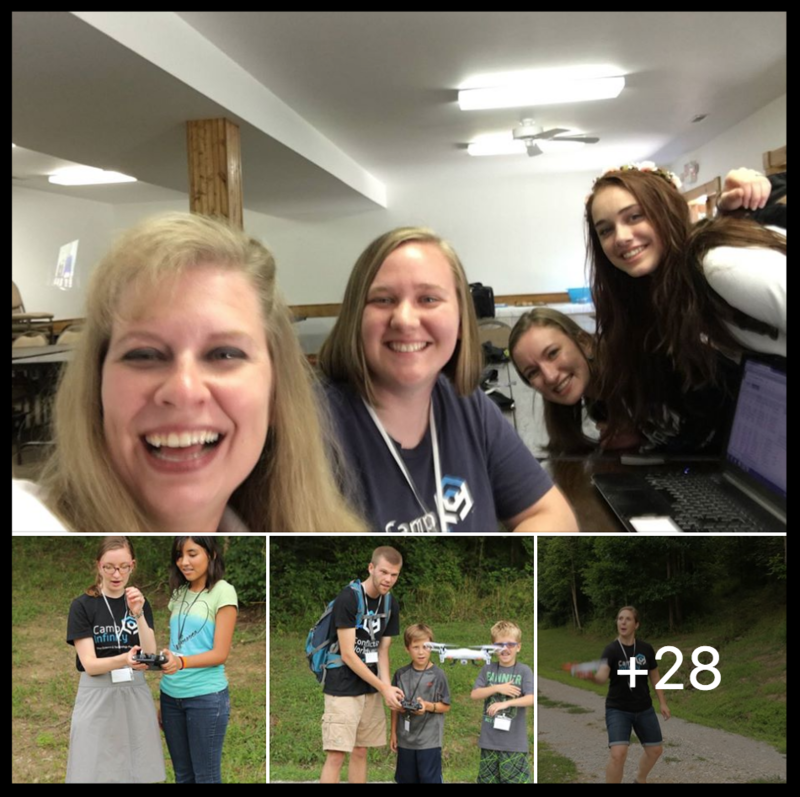 Campers from Home School Conferences - This summer was the first time to have several campers come after attending one of our Robotics & God workshops at a home school conference (we attended 5 in 2016). Our Sponsorship of the Camp Infinity Fossil Find @ Ark Encounter went live this week!!! We are working on an efficient way to capture contact information from those who see or participate in this cool, biblically-accurate, God-honoring STEM activity!! After 3 years of executing what we believe is the MOST unique and unprecedented STEM & biblical worldview camps, we have learned many things about the kind of campers God continues to send us. 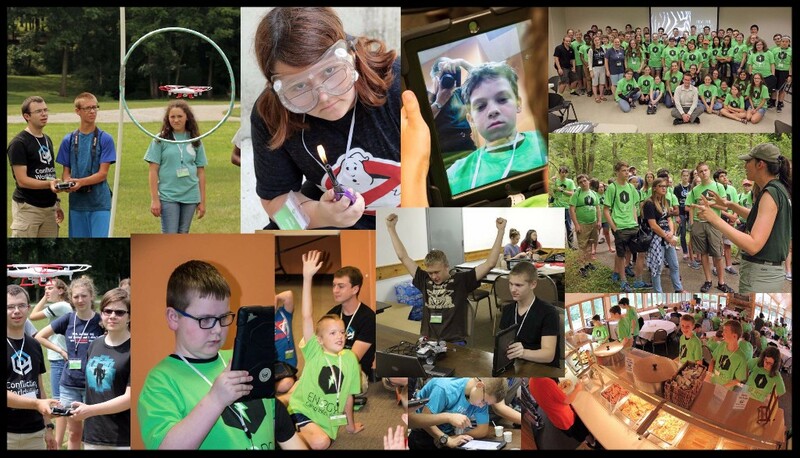 One of the things we hear over and over again from our campers is how they like being associated with Ci because they are accepted for who they are and not made fun of for being gifted with a strong interest in STEM. These young people have always liked our custom designed “geeky” t-shirts. So we decided to make them available for purchase. 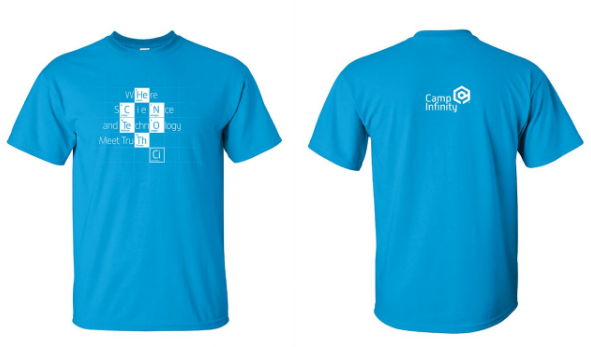 Use this form to order a cool “Periodic Table” shirt that says “Where Science & Technology Meets Truth." Here is a short sample of the blogs we have posted since the past newsletter. Seven Reasons to Send Your Child to Camp Infinity - Recently, as I was browsing through the Greenville Journal, an opinion piece entitled, “5 reasons to send the kids to summer camp” caught my eye. It was written by the executive director of the local YMCA camp to encourage parents to get their kids off the couch this summer and get them to camp for an experience they would never forget. Junior Day Camp a Big Success! - It’s hard to believe we’re already well into our summer camps for Ci 3.0. We’ve recently wrapped up a very fun and successful junior camp for students in grades 3 through 6. Thirty-eight enthusiastic campers from ten different states all gathered in Northern Kentucky to learn about STEM and God’s Word. We had a great week with these young campers and were thrilled to be able to help grow their love of science and deepen their understanding of God’s Word. We are working with Answers in Genesis (Creation Museum, Ark Encounter) and Potter's Ranch to finalize camp dates for summer 2017. We will announce the dates on our website and via email by September 1. We are making plans to have multiple overnight camps, a junior day camp, a family camp and a college camp. Your entire donation will be used to help financially needy students attend Ci 4.0. Camp Infinity is a registered 501c3 with the IRS. Thank you for your interest and prayers for Ci. We are thankful that Ci 3.0 was a success and would appreciate your prayers as we prepare to build the Ci 4.0 Summer Team!!! !